What did the viewers think? Click HERE for a special "view from the forums section" for Day 46. At 9.00am, with the main house still fast asleep, the HND Housemates have been awake for 30 minutess. Jayne and Spiral , it appears, kept everyone else awake by talking until 4:17am. After getting up, Jennie briefly joins Jayne in the kitchen. Jennie, Jonathan, and Michael then try out the garden for size, with an aerobic and exercise session. Jennie: "Did I wake you up?" Aisleyne: "Not you......i'm not in a good mood this morning... If I don't get sleep I'm grumpy." Jonathan: "You should sort it out." After that, a bit of unpacking and bed-making for Jennie. In the kitchen, Spiral is getting get stroppy towards Michael, because Michael doesn't like him kicking melons around and wasting food. Jennie and Jayne try to calm Spiral, telling him Michael wasn't having a go at him, just voicing an opinion. The first "shock" of the HND occurs at 1.17pm. Big Brother asks Aisleyne to gather all Housemates in the living room. The eviction process begins as Aisleyne is told to choose one Housemate to be evicted. Everyone is subdued until Michael says "babes I'll go", this relieves some tension and amuses the other housemates, especially Jayne and Jennie. Jennie soon becomes very subdued again and appears stressed at the turmoil Aisleyne is going through. Big Brother phone Aisleyne several times to keep the pressure on her to hurry up and choose. Jennie: " I cant believe you BigBrother you <<bleep>>"
Ais apologises profusely as she chooses to evict Jayne, but tells her she thinks she's going next door anyway. Aisleyne: "I had to make a decision"
Jennie: "It's a head f*** that's what it is.......this is where the game kicks in." Jen gives Jayne a goodbye hug saying "have a good time. be good...f**k it, be bad , what am I on about" and listens at the door to Jayne in the Diary Room. 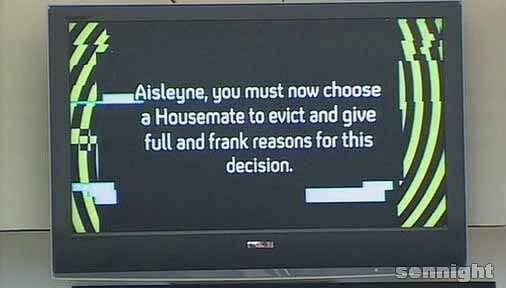 Jayne says she knew Aisleyne would evict her the minute the words came up on the plasma screen that this is what she had to decide. Jennie speaks to the group, supporting Aisleyne in what she had to do. Jennie says" my point is, if Aisleyne has done anything she's done Jayne a favour". She went on to say Jayne is "sick to death of being told to be quiet" and often said "I just want to go outside when I want to" so "that house is made for Jayne". Jennie then hears what's happening next door; "I've just heard her (Jayne) shouting and singing". Aisleyne and the others believe more strongly now that Aisleyne is choosing Housemates to go next door and, with those remaining up for real eviction. Big Brother then got tough with both houses, with the main house coming under scrutiny for discussing the outside world, then Jennie got a telling off for doing an impression of Imogen (who she was yet to meet) Jennie's response: "I can't be doing with people giving me a b********* in here. I'm not here to get shouted at. I'm never going to talk about anything ever again." Michael starts talking about positive energy, with an attentive Jennie listening on. Later, the HND discuss what Big Brother is planning/thinking, before having a nice chillout session and some fun. With Aisleyne having an early night, and after eating and giving Jonathon a head massage, Jennie has a maturity debate with spiral and Jonathon. Jennie: "When are you an adult...how old are you when you're an adult?....I class my self as an adult". Spiral: "When you get from 18 and hit your 20's you start to meet like real people...out there working earning money climbing ladders.......you learn a lot more about life"
Jennie: "But I could say that to you about when your 30." At this point, Jennie argues that maturity can be a never ending process, whereas Spiral believes it has an end and he's pretty much already there. Jonathon: "When I was 18 I was nowhere near as wise as I am now, it took me going through serious amounts of s**t". Jennie: "I've gone through things a 35 year old hasn't gone through". Jonathon: "When I was 18 I was nowhere near as wise as you, you've got a good head on ya"
Spiral: "You're an adult to me...you're a well mature young lady." Sprial begins to state the obvious, with Jennie finishing his obvious point for him saying "yes in 4 years time I will see even more". The debate draws to an end as they both say there weren't having a stab at each other, and things settle down. With Aisleyne still asleep, the Housemates go to the garden, with them doing impressions of Noel Edmonds and then a sing-song. Then it was bedtime proper, as Jennie went to sleep in the bedroom, alongside Aisleyne. THE NEXT DAY IN JENNIE'S BB STORY IS DAY 47.